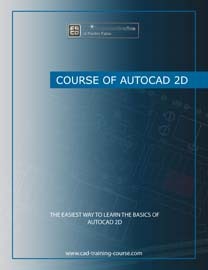 Site that offers an AutoCAD® basics course, to read for free online or buy in PDF tutorial (ebook). Follow the AutoCAD course on this site and learn quickly the basics to work with this fantastic design software. It is a "self-taught" course, thanks to which you will learn how to use AutoCAD. The AutoCAD course consists of a free online part and/or an e-book, that can be purchased from this site, in which you can find the same course, with in addition the description of more advanced features of the program. The basic course is open to all Autocad students who wish to learn the basics of this software, which is essential in order to start drawing with this powerful design tool. The aim of this AutoCAD course is to teach the concepts and usage of Autocad basics, enough to run and print technical drawings in 2D. Learn how to use Autocad from scratch in a simple and independent way. Learn quickly thanks to step by step command descriptions. Acquire knowledge of 2D basic functions. Improve your technical skills, and your curriculum vitae. You can have new opportunities in many fields of application. It's necessary to install a copy of the software on the PC to be able to exercise. The program installation is not covered within the course. Among the various versions the most economical is AutoCAD LT® a complete solution designed for professional 2D drawing applications. Hello, my name is Fabio Pardini and I deal with technical drawing and three-dimensional graphics. I worked over 15 years with autocad, during which I went through various employment sectors. I started working as a draftsman in 1994 at a company that deals with the design and supply of complete furnishings, mainly for the UAE. I've learned to use CAD, migrating from the normal technical drawing by hand. I then had the opportunity to put into practice what I was learning, right on the job. I think this helped me to learn because I was forced to concentrate on functions that are strictly necessary for the implementation of technical projects that I was making, but mostly I had the opportunity to continue to practice and assimilate the commands that I was learning little by little, avoiding to forget it. This base of experience has allowed me the time to investigate the more advanced features of AutoCAD, up to learn three-dimensional modeling and then to 3D graphics. Over the years I've had to explain to the use of CAD to each other and I realized that one problem for those beginning to work, was the difficulty of remembering the basic commands and the resulting confusion and slowness in run. I then wanted to write a basic course in each serving the same process of learning commands and functions as it was taught to me, with the added advantage of staying at your disposal, so even if you do not remember some steps, you can always go back to see them again. I do not therefore propose to follow the normal Autocad classes along with many people, where it done a general overview of the program through the many functions that can be quickly forgotten. Nor is it a technical manual where the commands are classified in alphabetical order without following a logical thread, but it is a proper guide by which step by step learn to draw with AutoCAD in two dimensions (2D), regardless of the version of the software! This is a practical course, where with detailed instructions and pictures, I will guide you through the main 2D functions of this software, step by step, as if i ran with you, so quickly and with a little practice you can start to work with this powerful and flexible software. Autodesk, AutoCAD, DWG are registered trademarks or trademarks of Autodesk, Inc., and/or its subsidiaries and/or affiliates in the USA and/or other countries. All trademarks mentioned herein belong to their respective owners and are shown by way of reference to the completeness of the information exposed. There is no relationship / agreement / correlation between the author and the owners of any trademarks mentioned in the site. Do you like this site? Donate with PayPal to keep this content for free.